2006 has been such a fantastic year for pop music that we at AVID have decided to celebrate it by naming our traditional end of year Karaoke after it! 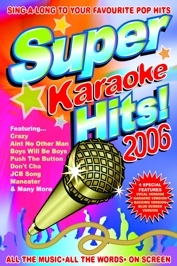 So we present Super Karaoke Hits 2006, it does what it says on the cover, features 16 of the greatest tracks from a great year. You can sing a long to some amazing covers of pop classics from such artists as Gnarls Barkley; Sugababes; Nelly Furtado; Rihanna ; Scissor Sisters; Lily Allen and many more. 2006, surely a year to be celebrated and remembered as one of the great ones and with Super Karaoke Hits 2006, you too can join in the fun!